Directed by the renowned Dr. Harry Von Piekartz, PhD, MSc, PT, MT and President of CRAFTA® (Cranio Facial Therapy Academy). Imparted by Michiel Trouw, M.Appl.Sc, MT, PT and International CRAFTA Teacher. Organised by Espai Gal·la Placidia. One can impossibly think of the diagnosis and treatment of headaches and facial pain with its interactive characteristics without including an interdisciplinary approach. Despite all efforts practitioners still find themselves left alone in the treatment of the patient’s complaints. The CRAFTA education program is patient centred and will satisfy the demands of critically questioning medical doctors and therapists as well as the more practically thinking colleagues. Physiotherapists have shown an increasing clinical and practical interest over the past few years in the craniomandibular and the craniofacial regions. 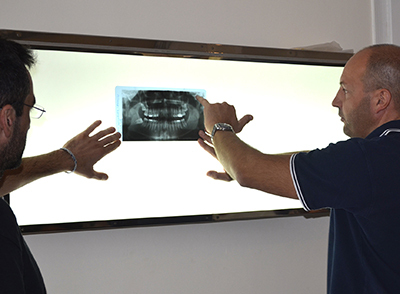 On this background, CRAFTA® (Cranial Facial Therapy Academy) was founded by Harry von Piekartz. In the following chart you will be able to see how the CRAFTA courses are organized. • The Basic Course, imparted by Michiel Trouw, consists in two parts that will be given in two seminars of 5 days each. • The Advanced Course, imparted by the Professor Dr. Harry Von Piekartz, consists in a practical course, that will be given in two seminars of 5 days each, aiming to form hypotheses, reflect decisions and achieve an efficient management of complicated craniomandibular and craniofacial síndromes, including a physiotherapeutic treatment protocol. 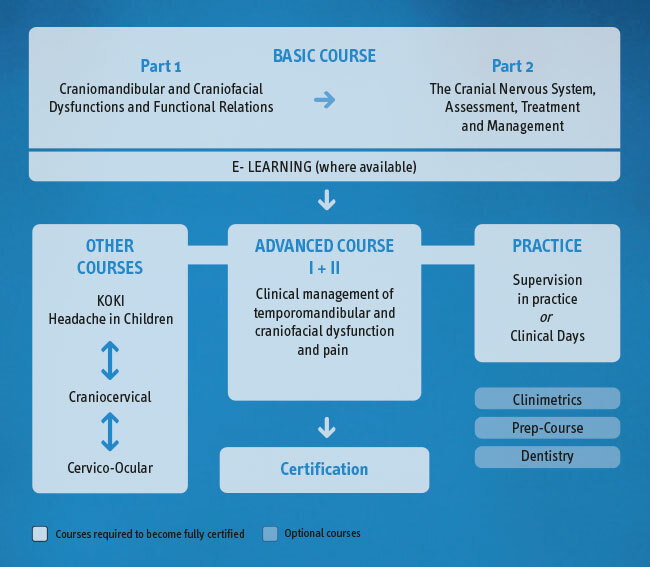 Furthermore CRAFTA offers three monographic courses, with 3 days of duration each, about the following topics: Headache in Children, Craniocervical Region, and the Cervico-Ocular System. Pain mechanisms of the relevant craniomandibular structures, the function of the temporomandibular joint (TMJ) and the neurophysiological, biomechanic and functional relation to the cervical spine are the main contents of this course. The subjective examination, physical examination and treatment techniques of the TMJ and an update on neurobiological and anatomical knowledge of the TMJ function are primary topics. The cranial function and knowledge of the evidence-based adaptation and movement patterns of the cranium (craniodynamic) are also presented in this course. It will provide an overview of pain mechanisms, assessment and treatment techniques at the calvarium and give you an update on neurobiological and anatomical knowledge of the cranial structures and function. A theory presentation will include dentistry aspects like brace therapy and introduce the syndromes: bruxism, bracing, (cervical) headaches, neuralgias, the otomandibular syndrome and tinnitus. The course is well balanced regarding theoretical and practical sessions. This seminar focuses on the recognition of clinical patterns of cranial nerve dysfunctions and neuropathies. Conduction tests and neurodynamic tests of all cranial nerves are presented as well as nerve palpation. The practical sessions will include the mobilization, fascilitation and massage of extracranial nerves. The total price of CRAFTA® Basic Course is € 1600. To book your seat you will need to make a first payment of 600 € to the bank account we will tell you by phone or email. The registration for this course becomes effective once the registration fee is received; the confirmation of available seats in itself is not a guarantee of booking. The total amount should be paid by the beggining of the course. The course will be given in English with consecutive translation in Spanish. Barcelona is the capital city of the autonomous community of Catalonia in Spain, and the second largest city in the country. With its Rambles, Barcelona is ranked the most popular city to visit in Spain, with numerous recreational areas, one of the best beaches in the world,mild and warm climate, historical monuments, many good-quality hotels, and developed tourist infrastructure. It is the largest metropolis on the Mediterranean Sea, located on the coast between the mouths of the rivers Llobregat and Besòs, and bounded to the west by the Serra de Collserola mountain range, the tallest peak of which is 512 metres (1,680 ft) high. Barcelona is today one of the world’s leading tourist, economic, trade fair/exhibitions and cultural-sports centres, and its influence in commerce, education, entertainment, media, fashion, science, and the arts all contribute to its status as one of the world’s major global cities. Barcelona is the home of many points of interest declared World Heritage Sites by UNESCO, like many of the works by Antoni Gaudí, including the Sagrada Família, the international symbol of Barcelona, Park Güell, Palau Güell, Casa Milà (La Pedrera), Casa Vicens, Casa Batlló and the Crypt in Colonia Güell, as well as other buildings and monuments by others renowned architects such as Palau de la Música Catalana, Hospital de Sant Pau, Barcelona Cathedral, Church of Santa Maria del Mar, Gothic church of Santa Maria del Pi, Church of Sant Pau del Camp, Columbus Monument and the Arc de Trionf, a triumphal arch built in 1888. Barcelona also contains seven beaches, totalling 4.5 kilometres (3 miles) (2.8 mi) of coastline beach. Barcelona beach was listed as number one in a list of the top ten city beaches in the world according to National Geographic and Discovery Channel. For football lovers, Barcelona is also home of the football team FC Barcelona (Barça), one of the largest in the world. One can visit its stadium, the Camp Nou, where also a FCB Museum is found. The gastronomy of Barcelona can be described as a dynamic combination of tradition with a variety of influences from other cultures. With a Mediterranean flavour at its core there is a lot of originality in the dishes due to Barcelona’s closeness to both the sea and mountains. Our centre, Espai Gal·la Placídia, is situated in the neighbourhood of Gracia, which is well known for its squares, terrace cafes and bars, and at only 20 minutes walk (and only 5 minutes by metro) from the city centre, Plaça Catalunya, where you will be able to visit the Rambla, La Boquería market, Gran Teatre del Liceu (Barcelona Opera House) and the Columbus Monument. In this walk, from Espai Gal·la Placídia to Plaça Catalunya through Paseo de Gracia, you will be able to visit also two of the most beautiful works by Gaudí, Casa Batlló and La Pedrera, as well as other very nice buildings. The street of Paseo de Gracia is also one of the city’s most popular shopping areas. Hotels: Please don’t hesitate to contact us, info@espaigallaplacidia.com, to receive a list of the closest hotels to our centres. Take in account that June is high season in Barcelona, so the sooner you book, the better the price you will get.